In my ongoing quest to choose a new two-up tourer and all-year commuter, I’ve ridden BMW’s two big boxer-engined bikes, as well as Triumph’s flagship triple. I’ve experimented with middleweight adventure bikes in the Tiger and found them lacking. All the faired middleweight sport-touring bikes like the Bandit seem to have been whittled down to a few cheaper, lower-powered variants in Kawasaki’s ER-6F, Yamaha’s XJ6 Diversion F and Honda’s new CBR650F. And while I may not be a power snob, 70bhp for two riders and all their luggage doesn’t leave a lot for overtakes on uphill mountain passes. The new VFR? Tempting, but Honda’s dirty little secret with its VTEC engine is the £800 16,000 mile valve check. Kawasaki’s updated Z1000SX has decent power and epic brakes, but like the VFR it starts at more than £10k without luggage, and I doubt either bike would return much more than 45mpg when commuting. No, I needed something else, something that had been designed from the ground up to be efficient, easy to live with and wouldn’t break the bank. Rosa promptly pointed to a bike I (and everyone else) seemed to have overlooked: BMW’s recently updated F800GT. I’ll take mine in orange, please! Strictly speaking, the F800GT is a new bike in BMW’s range, replacing the recently-dropped F800ST early last year. But while the changes are innumerable and not all minor, it remains the same torquey parallel twin-powered bike I cross-shopped my 650 Bandit against more than three years ago. Crucially, the two main criticisms I had of the bike back then have both been addressed; the vibrations through the handlebars have been significantly damped, and the clear plastic screen no longer flaps around like a playing card in bicycle spokes at motorway speeds. Plus it looks a heck of a lot better in my opinion, the slightly awkward lines of the fairing and tank hump smoothed out to make an altogether more stylish bike. It’s still almost £10k once you’ve added heated grips, a centre-stand, a full set of luggage, and a few other extras, but at least the panniers are all-new, much larger, and closer to the traditional (more practical) black boxes adorning the R1200R than the fragile-looking expandable pods the ST could be optioned with. 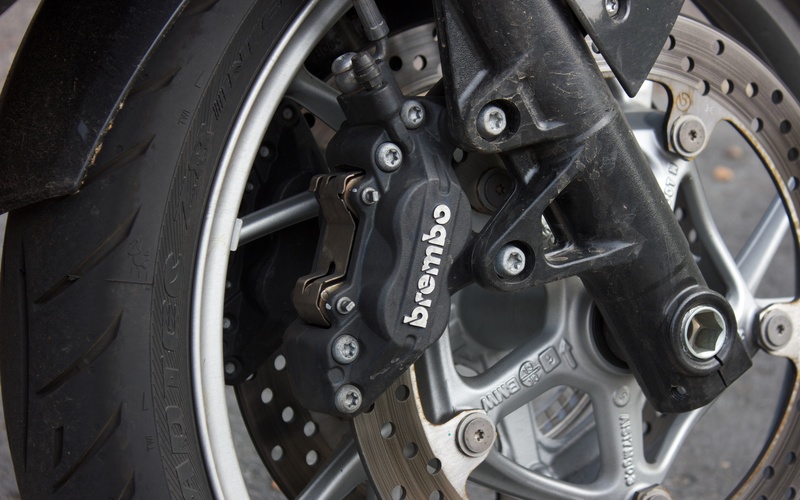 ABS is now standard on the excellent Brembo brakes, and the redesigned fairing cleverly redirects wind away from your legs and even hands, so hand guards would not be needed for winter riding. As stock the BMW comes in a full £2k more than its budget competitors – Kawasaki’s ER-6F for example – but it’s still £2k cheaper than the VFR800 or Z1000SX – and the gap stays about the same when you spec everything up for two-up touring. Thing is, I still reckon the BMW is the better bike. Throw all your chain lube in the bin and scrap your Scottoiler! Let’s start with the chain – or rather, the lack thereof. 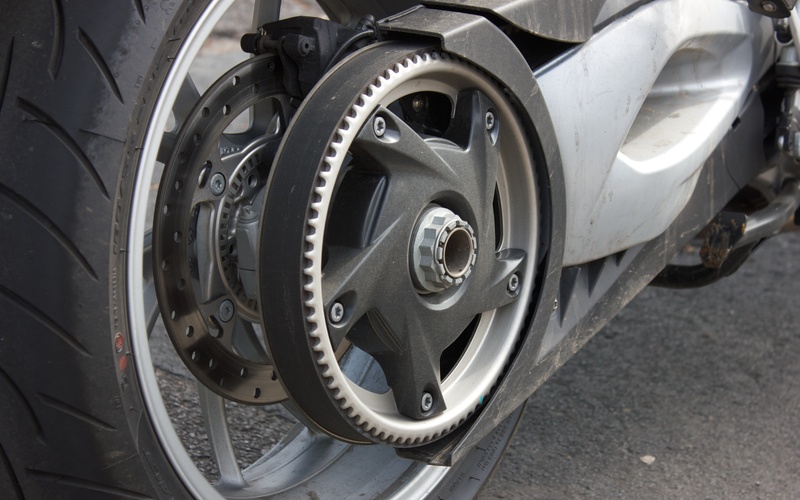 The F800 uses a kevlar/rubber belt and pulleys instead of a chain and sprockets, reducing driveline lash and crucially reducing weekly maintenance in this department to zero. Belts don’t need oiling or adjusting, ever – and they’ll outlive even a well cared-for chain to at least 24,000 miles (BMW’s own specified service-interval, but owners online have often managed much more). Next we have the engine. The BMW’s 90bhp sits neatly in between the ER-6F’s 74bhp and VFR 106bhp, and is positively dwarfed by the Z1000SX’s 140bhp. Power-to-weight ratios are favourable, with the F800 trouncing the 2kg-lighter ER-6F and almost matching the 239kg Honda. If I were after the fastest, most exciting way to get to work, the big Kawasaki would certainly win, but I already have thrills galore in my Street Triple. And where the BMW destroys all its competition is in its staggeringly good fuel economy. Fuelly.com confirms that some owners are managing to average as high as 70mpg, and on a spirited two-up run I managed to best my Street Triple’s average by 10mpg to 64mpg. The 650 twin in the ER-6F can’t match that, and the bigger, more powerful bikes would cost considerably more to run as daily commuters. Beyond that it’s the little things that add up, and unlike on the Tiger it’s in a good way. I’ve seen what the Kawasakis look like after a few thousand miles in the wet, and I’d be furious if I’d spent thousands of pounds on something that had so little corrosion resistance. 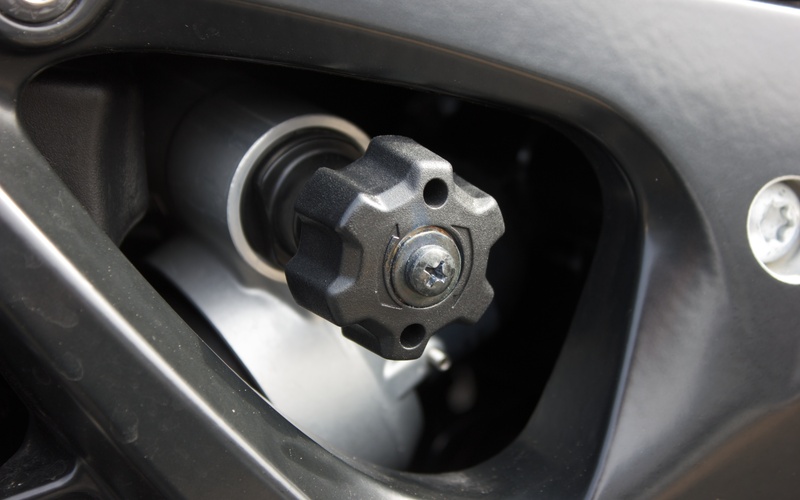 The BMW on the other hand oozes quality – even the brake fluid reservoir looks like an expensive aftermarket part. I tend to pore over a new bike, even getting down on hands and knees in dealerships (to the amusement or bemusement of staff) to look underneath and examine shock linkages and engine casings. I couldn’t find anything on the BMW to put me off – not a single cut corner, flimsy bit of plastic, amateur welding job or patch of suspect paint. It looks built to last – and with the fairly low-tech traction control system utilising existing ABS wheel-speed sensors to watch your back, I can’t imagine that system going wrong in a few years’ time. The optional heated grips seem to defy physics by being just as small as the standard grips on my Street Triple, a far cry from the bulky aftermarket (or even OEM Triumph) upgrades. The switchgear is of excellent quality, with none of the cereal-packet-toy plastics seen on so many top-dollar sports bikes. My one criticism here would be that the indicator switch moves very little in either direction when prodded by your thumb, the feedback ‘click’ being so subtle as to be almost imperceptible through my leather gloves. Eventually you get used to it, and it’s still better than the unnecessarily-different three-button system on the older ST, but it’s odd that BMW couldn’t build in a bit more positive action. I’m a sucker for clever engineering solutions, and BMW has these in spades. 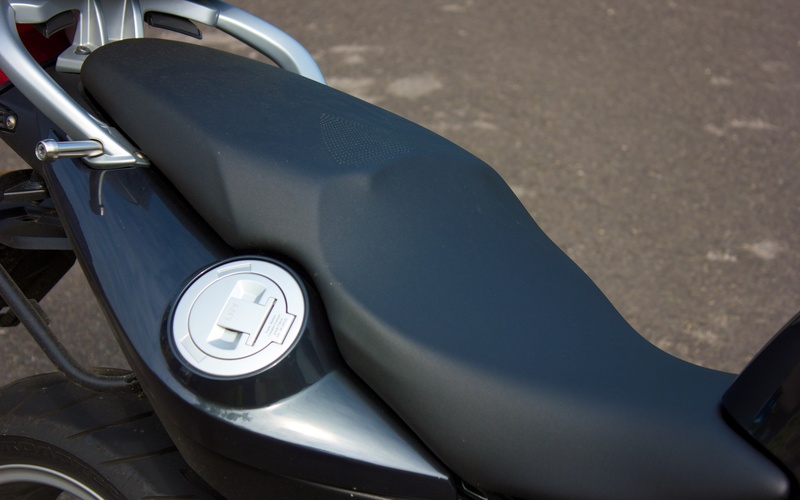 The fuel tank is actually a shaped plastic compartment sitting under the rider’s seat, with the filler cap placed on the right of the tail pod. 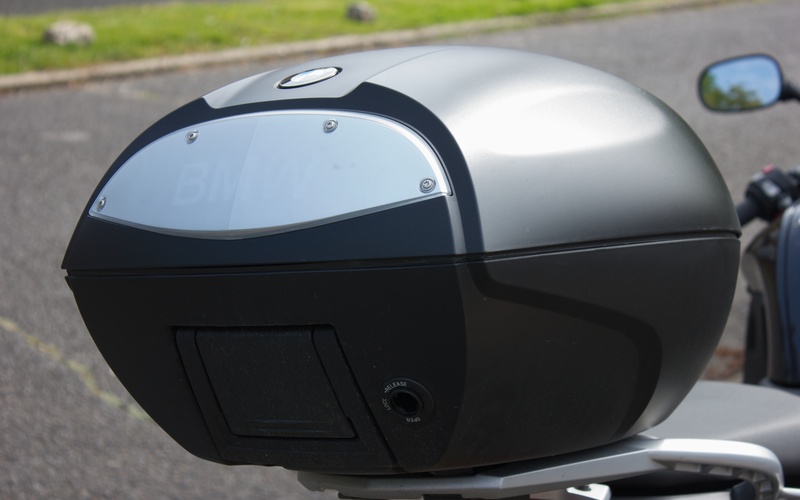 While this means you won’t have to remove your tank-bag to fill up anymore, the plastic airbox cover pretending to be a traditional tank won’t take a magnetic item for obvious reasons, so a bespoke item from BMW (or a few aftermarket suppliers) would be needed. The objective is to keep the weight of the 15l of fuel as low down in the bike as possible, making the bike very easy to handle at low speeds. The optional addition of BMW’s much-hallowed Electronic Suspension Adjustment had me pretty excited at first given its low cost as an option, but it turns out that the three bar-selectable modes only adjust the damping on the rear shock. And although I could certainly tell the difference between Comfort, Normal and Sport, I feel the £280 would be better spent getting the whole bike set up at a suspension shop instead. As good as the stock suspension was, I’ve learnt from my experiences with my Street Triple that an expert can work wonders, and that no-one is the “ideal” weight for their bike’s existing forks and shock. 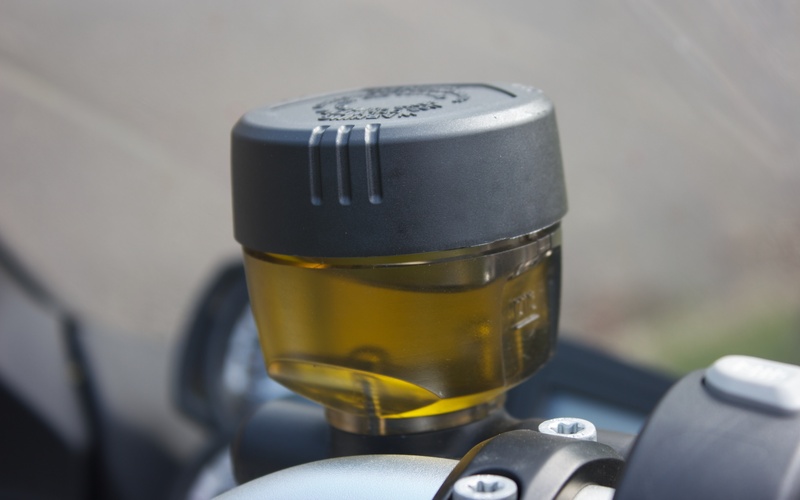 At least BMW have fitted the bike with a remote preload adjuster knob, making switching from solo riding to fully-loaded touring a matter of a few (very stiff) twists of the wrist. I don’t like the dashboard. It’s more or less unchanged from the original F800 design of 2006, and it shows. 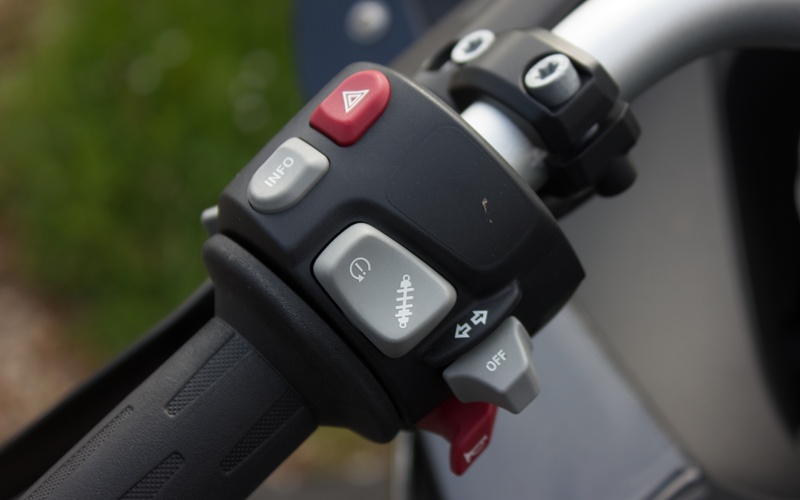 While the ability to switch through readouts on the on-board computer via a button on the bars is welcome (and something more bikes should be equipped with), the computer itself is an optional extra. Fail to tick the box at purchase time, and you get an ugly blanking plate and lose fuel gauge, engine temperature, gear indicator and all the fuel economy readouts. 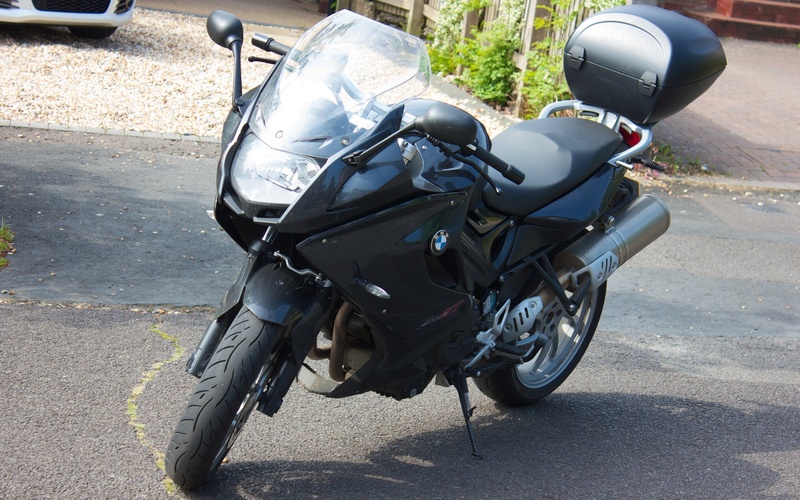 Considering that all BMW have to do is flick a switch in the bike’s ECU and remove a bit of plastic, it seems like needless price gauging in my opinion. And as much as I like analogue dials, the reality of modern bikes is they don’t work, especially if the speedo goes all the way to 150mph in both miles and kilometers. It takes several seconds with your eyes off the road to home in on the numbers and see exactly how far over the limit you are – not safe; not for you, your surroundings, or your license. 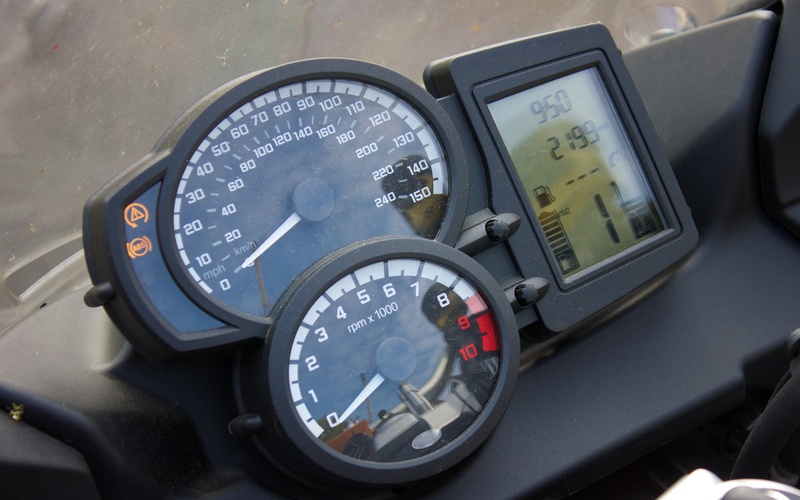 The digital speedo/analogue tachometer combo that both my Bandit and Street Triple use(d) works much, much better, and I’m surprised that BMW (and so many others) persist with this system. But overall, I think we might have a winner. Although somewhat coarse and harsh, there are hints of an epic exhaust note waiting to be unleashed by something less restrictive, and there’s a surprisingly potent power band lurking at around 7,000RPM. Throttle response is excellent and handling sublime, making stringing high-speed corners together seem effortless. The effective fairing makes for a very relaxing ride, although it also makes it far too easy to travel quite fast without realising. Pillion comfort was good, although I personally might benefit from BMW’s optional comfort seat for longer journeys. Compared to Triumph’s Tiger, there’s nothing on the BMW that feels cheap or thrown on for the sake of pandering to a popular trend. It won’t rip your arms out of your sockets or wheelie in third gear, but it’s not so much slower than my Street Triple that I’d find it frustrating when trying to overtake. It doesn’t have the scalpel-like edge of a true sports bike, but what little you give up in the power department the F800GT makes up for by being supremely competent and practical in all areas. It looks great, with premium touches like the single-sided swingarm and sculpted three-piece fairing managing the unique trick of looking sporty whilst maintaining an upright riding position, with wide, close-set handlebars. And, for those of shorter stature, the standard seat it remarkably low and narrow, meaning that yours truly could flat-foot the bike with ease – and an even lower seat is available as an option. The luggage rack is standard, and choosing the optional top box doesn’t leave a hideous vestigial mounting plate when you leave the box in the garage; it’s all designed to work together as-is and be both practical and subtle. The pannier rails are almost as good – only dedicated touring bikes like the RT and Trophy leave less evidence when the boxes are removed from the bike, a far cry from the scaffolding that adorned by Bandit. 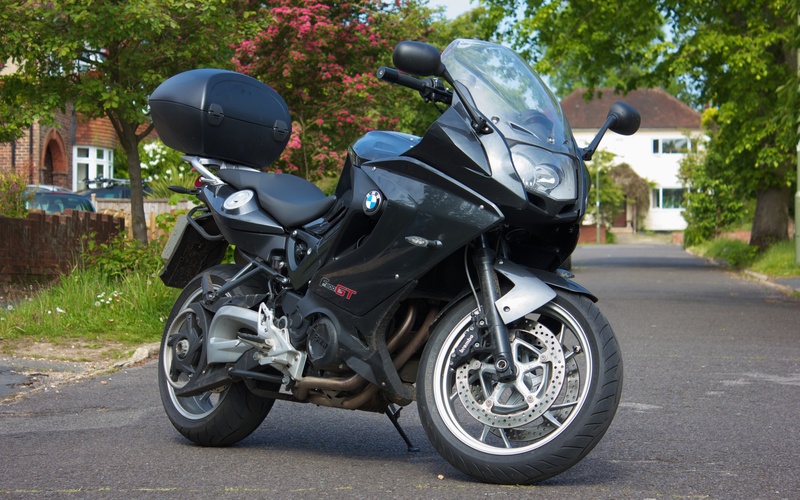 And if you’re sick of having to carry an entire key chain just for your motorcycle, good news – all the BMW luggage is key-coded to your ignition key at the factory, so one key will open everything! Now it’s true that a dedicated tourer like a Yamaha FJR would be more powerful, meaning effortless overtakes when riding two-up. And it’s also true that the F800GT can’t match the Trophy or RT’s fairings for truly all-conquering weather protection, or indeed their suite of fancy toys. But those are £15,000 and up motorcycles, some of which weigh a full 50% more than the middleweight BMW. Imagine trying to pull a 330kg Honda ST1300 backwards out of a parking spot on your own, or trying to squeeze a fully-panniered Trophy through rush-hour traffic as a commuter. Higher power merely means you’ll be going much faster when you get to the next corner, and the extra weight means you’ll have to brake much harder and much earlier for those blind alpine hairpins. A good tourer doesn’t need a 1200cc engine. Do you? I’ve heard more than one BMW salesman express frustration at how many of his customers won’t even try the F800GT because it’s not based around a litre-plus high-powered engine, as though every biker must, as a point of pride, buy the biggest, fastest bike they can afford. And it’s a shame, because I think a lot of them would discover (as I have) that the sleek little bike parked unheeded amongst the hordes of tough-looking R1200GSs and continent-conquering R1200RTs is in many ways the better motorcycle. May 19, 2014 in Reviews.